Whether you like modern, minimalistic lines, traditional, classic kitchen cabinets, or Shaker Cabinets, we have the right option for you. Take look at our wide choice of wood kitchen cabinets, find the style and color you like the most, and let our specialized designers input your choices into our 3D software. This will show you exactly how your new kitchen cabinets will look like in your home. 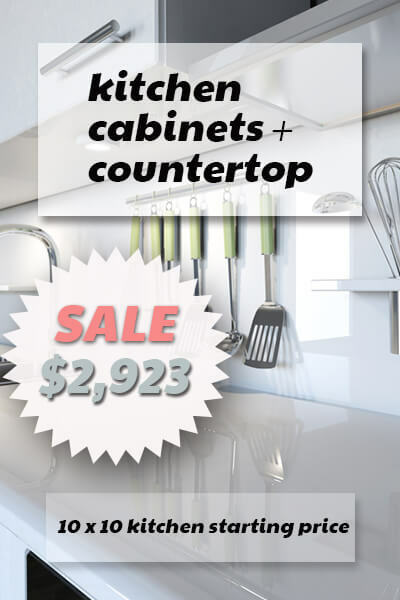 You can also combine kitchen cabinets and granite countertops and get a special package deal! Discover the beautiful and exciting world of kitchen cabinets design with us. Contact us today for a free, no-obligation estimate, on cabinets for less in NJ. 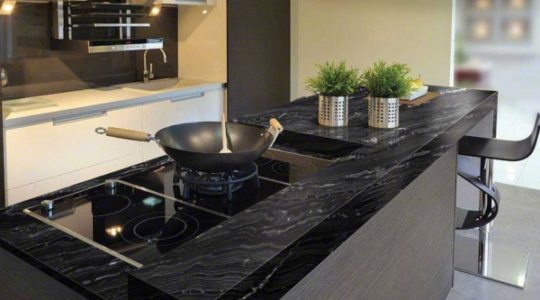 Once you’ve browsed and found the perfect granite surface for your kitchen, our experienced staff will fabricate the granite slab of your choosing, using professional cutters and professional equipment, on site. Best service and granite for kitchens in New Jersey are available at our granite yard in Wayne NJ. Get free fabrication, sealer application, edge treatment, stainless sink, and installation, all within a week! We carry some of the most beautiful granites, like Giallo Ornamental Granite, Typhoon Bordeaux Granite, and ever-popular Black Granite Countertops. Indulge in so much beauty, for so little! Take advantage of our services and low granite prices. Contact us today for a free, no-obligation estimate. From beautiful, neutral gradients of white, gray and black to brilliant sapphire, gold and ruby variants, your quartz countertop can make a statement as bold or as muted as you like. Choose and decide on the color, brand, and edge profile. We will then take measurements, create a template, and perfect your quartz counter to your specs within a week! 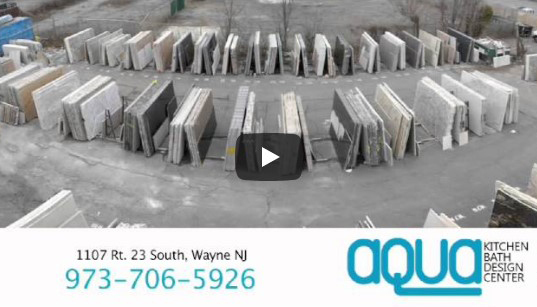 Whether you decide to go with quartz or Super White Quartzite, we guarantee lowest quartz countertops cost in NJ, exceptional durability, superb color selection, highly professional service, and quick delivery! 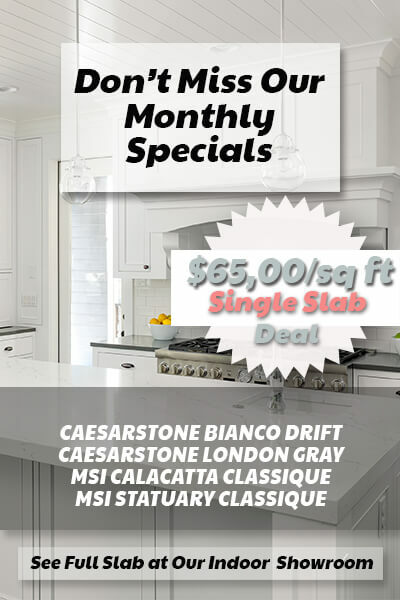 Enjoy the superb beauty of our low-cost quartz countertop surfaces and use the opportunity to get a free, no-obligation estimate. Contact us today. Browse through our showroom and our slab yard countertops New Jersey. 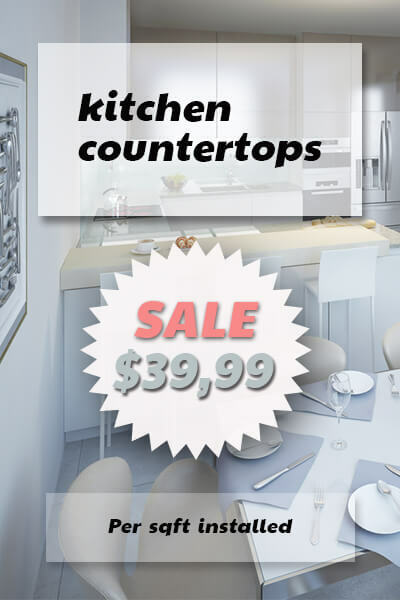 Enjoy while discovering the best colors and designs kitchen cabinets and kitchen countertops. We take pride in the craftsmanship and quality of our countertops and kitchen cabinets, and we know that you will, too! Aqua Kitchen and Bath Design Center provides on-time, courteous, professional, and respectful service. We are the best in NJ because we guarantee lowest prices, exceptional quality, superb selection, quick delivery, and professional installation. Our professional designers have many years of experience. They use top-notch 3D modeling software so you can not only imagine but actually see the products in your home. Aqua Kitchen Bath and Design Center is conveniently located in Wayne, NJ, close enough to everyone who lives in NJ or neighboring states. Our deals, quality, and top-notch service will make your visit a success! We are in business since 2006 and we make history together with our satisfied customers. Numerous testimonials on Google, Yelp, Houzz, and Facebook tell some wonderful stories of how we make NJ homes better. Aqua Kitchen and Bath Design Center Team will not only help you decide which product to choose and handle it until the moment you have it in your home. We also inspire kitchen and bathroom renovation projects. Make sure to visit our Blog and our social media sites to find exciting interior design ideas and helpful tips. Your dream is our goal. You imagine – we provide. Let’s make a beautiful kitchen together! Contact us today for a free, no-obligation estimate and enjoy all the benefits we can provide for you. 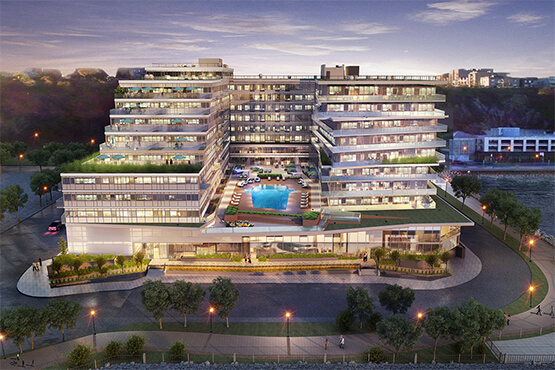 Aqua Kitchen and Bath Design Center is proud to have been trusted to equip 175 kitchens in Avora Living Port Imperial with luxurious quartz countertops. 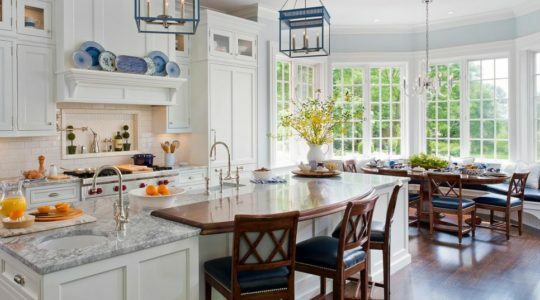 We follow and collaborate with top designers, architects and builders in NJ as well as top kitchen and bath news magazines like: Kitchen & Bath Business, Better Homes and Gardens, Kitchen and Bath Design News, HGTV Dream Kitchen and Baths, NKBA National Kitchen and Bath association and many more… Follow our blog for kitchen and bath design news.